Soybean drink, 100% vegetable made of soy bean and cane sugar, can be used for instant delicious drink, rich in vegetable protein. 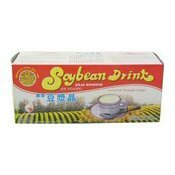 Soybean drink can be enjoyed hot or cold for breakfast or at any time of day. Dissolve the contents of one packet (22g) with a little less than a tea cup (200ml or 7 oz) of cold or hot water. It tastes better after being cooled in the refrigerator or added into your black coffee drink. Allergy Advice: Contains Soy Bean. Ingredients: Soy Bean (85.0%), Sugar. Simply enter your details below and we will send you an e-mail when “Instant Soybean Drink (速溶豆漿晶)” is back in stock!